Okay, never said I wasn't cheap. Pictured is the plastic push button one pushes to release GPS from the RT's cradle. I was thinking, just drill a small hole to insert a small screw (bolt) so the button can not be pressed in far enough to release GPS unit. Probably something with a Allen head or other less common fastener. Believe I'd feel comfortable leaving unit in cradle with such a set up when stopping for short periods like lunch or while in a gas station. Otherwise, for overnight motel parking lots and the like be able to easily remove the screw to safely pack unit away. Has anyone tried this - results? Haven't tried it but that's exactly what I was thinking, I chickened out on drilling a hole in my new bike. The first day I got my bike I forgot and left my GPS on the bike and went up to my wifes office for about 10 minutes then left and sat down at an outdoor restaurant and noticed a hobo looking at it, when he reached for it he luckily turned and saw me staring at him and took off, I got up out of my seat and was ready to tackle him. I didn't have to say a word, he knew he was going to die. Last edited by Pabst; Apr 4th, 2019 at 8:32 pm. Before you drill a hole in it you might want to determine if it is hollow or solid. I wouldn't drill a hole in it if it's hollow. What I'd like to see is a 3-D printed "donut" that would encircle the release button, with a small set-screw in the donut to hold it in place around the release button, preventing anyone from pressing the release button w/o undoing the set-screw/donut from the release button. Maybe someday I can convince a college kid w/access to a 3-D printer to print me one. Shouldn't cost more than a $1 or so of raw materials. It's criminal a locking mechanism wasn't built into the bike by BMW. We should demand a recall. So few people would even know about the release button so if a thief decided they wanted to steal it they would likely start prying before even looking for a release button, especially under the tension of a theft in progress. Would another RT owner take it? Very unlikely I think, though of course possible. The ONLY real solution is as you say--take it with you. 2nd option is put it in a locking cubby. I put velcro on top of the GPS Prep and a strip on my jacket collar so what I do for short stops away from the bike is just drape my jacket over the whole dash w/ the velcro holding it to the upper surface of the GPS prep. This avoids anyone even seeing it so it's good for reasonable security when I'm off the bike for shorts stops to take a whiz or what have you. Last edited by NoelCP; Apr 5th, 2019 at 10:33 am. So with any luck, they only steal your jacket? I appreciate the comment made. Never thought a screw would be a deterrent to a professional. Thinking more about the "kid" who saw an easy target and attempts a two second try. And to the idea that a RT rider or any biker for that matter, wouldn't attempt this known weak link...I wouldn't be so sure about that...there have been thefts at a BMW rally? Thinking the hollow or not release button does need consideration. I'm not so sure either which is why I said it was very unlikely and I still believe it is. The real solution is just take the thing with you it takes about exactly the same time to remove it as it does to fiddle w/ a key or anything else. I have an old Zumo 550 that I really use only for the speedometer, and over the years, my Zumo power button, and cradle have deteriorated. 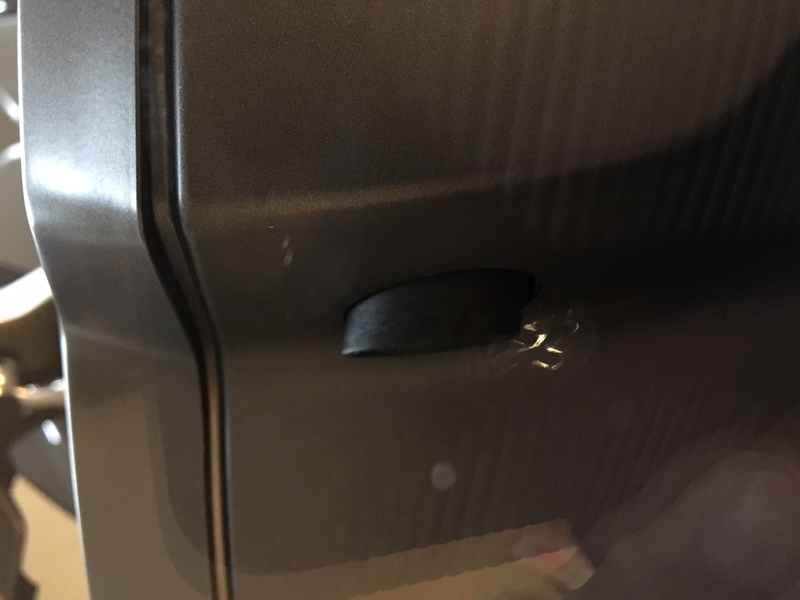 I have duct tape over the power button, and another piece over the locking tab on the top. Not very attractive, it also signals that this is an old, perhaps not in great shape unit. Works so far. For directions, I usually use WAZE in my helmet. I think you're spot-on . . . BMW engineers could have easily dealt with this BASIC security issue. I got the security lock listed on Oldtimers.si from RT-Motofriends (Facebook). I got the unit in five business days and installed it yesterday. Works as advertised. I'll still take the unit out for over night stays at hotels, etc. Yea they used to just be interested in jump'en freight trains, now they're jumping RTs! LOL! What did it cost US dollars including shipping? I think the firs thing I noticed about my new to me RT is the lack of a GPS lock system. Even these add-ons seem a bit flimsy to a thief with a screwdriver. I would have loved to see the GPS slide down behind a window or something to lock it in place. €118.99 EUR. This included shipping. That's about $134. Wunderlich charges €99 for theirs and it's hideous and requires a seperate key. I love the Oldtimers solution. Invisible, linked to central locking, and far more secure. If you have central locking on your RT, this is the way to go. When this thing is locked, the only way to get the GPS out without destroying it, is to take everything apart. And for this you need torx bits and the knowledge of how to get it apart.
. Even if you have the torch bits unless you can raise the windscreen you'd have a hard time removing the top dash cover. I can't recommend the Old-timers.si solution enough. I'm extremely satisfied. . . . . I would have loved to see the GPS slide down behind a window . . . . I paid the invoice from RT-Motofriends on March 23rd (Sat) and received the kit on April 1st. Just over one week. Very fast considering it came from Germany. Takes about a week to 10 days for me to receive items directly from Old timers.si. I think that's very good coming from Slovenia to the USA. Has anyone in the USA been charged a customs fee? So far I've never been charged a customs fee for anything that I have received from out of the country. I ordered 2 of these locks from Oldtimer today. They are sending me the version with a Sirius antenna platform on them. They are 10 euros more. The price keeps going up. $140EUR each - $325.00US for 2 of them.... shipping included. So far I have new been charged for any custom fees for anything I buy in the EU. Its already wrapped up in the price or they have figured a way around it. Last edited by tvguy; Apr 11th, 2019 at 9:08 pm.